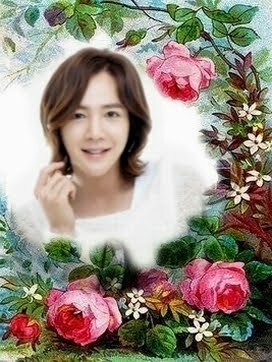 BYJ, JKS, LMH & Hallyu Star (Asian Drama - Movie) : Thailand Site...: Hanbok (한복) : Traditional dress of Korea...by Amornbyj. Hanbok (한복) : Traditional dress of Korea...by Amornbyj. 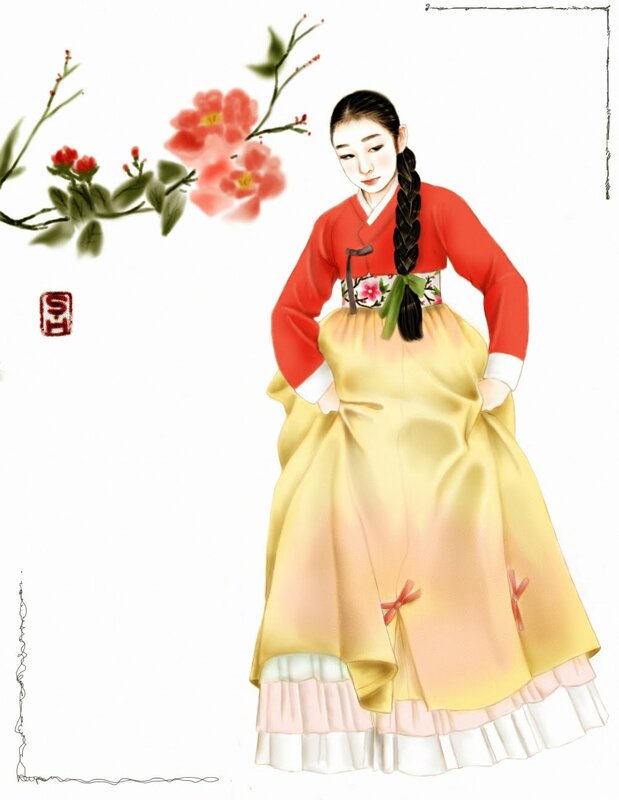 The beautiful Korean hanbok is an indelible symbol of Korea. Hanbok literally means “Korean clothing”. It is usually characterized by simple, elegant lines without pockets and bright, vibrant colors. The styles seen today are based on the Joseon Dynasty-style formal or semi-formal wear worn in traditional celebrations or festivals. Women’s hanbok consists of the jeogori or chogori – the short jacket – and the chima – the long, wrap-around skirt. The men’s hanbok consists of a longer jeogori and baggy baji or pants. The inherent beauty of the hanbok is the abundance of material – they are not meant to be tight fitting. Curves or curved features are important in traditional design of the hanbok. The queen consort, the king’s concubines, sanggung (court matron), and yangban women (nobility) wore the garment over a short jacket called jeogori. According to color, there were yellowish green, purple, navy, and white-colored dangui and others, but yellowish green colored one was the most commonly worn dangui during the time. In addition, dangui can be divided into two types depending on its layer; a double layered dangui (gyeop-dangui 겹당의), and a single layered one (hot-dangui, 홑당의). The former was usually worn during winter while the single layered dangui which is also called dang-jeoksam or dang-hansam was worn for summer. As the Queen wore a white dangui made of a single fabric the day before the Dano festival which falls on the 5th day of the fifth month of the lunar calendar, every women at court followed to change their clothing to the single layered one the next day. 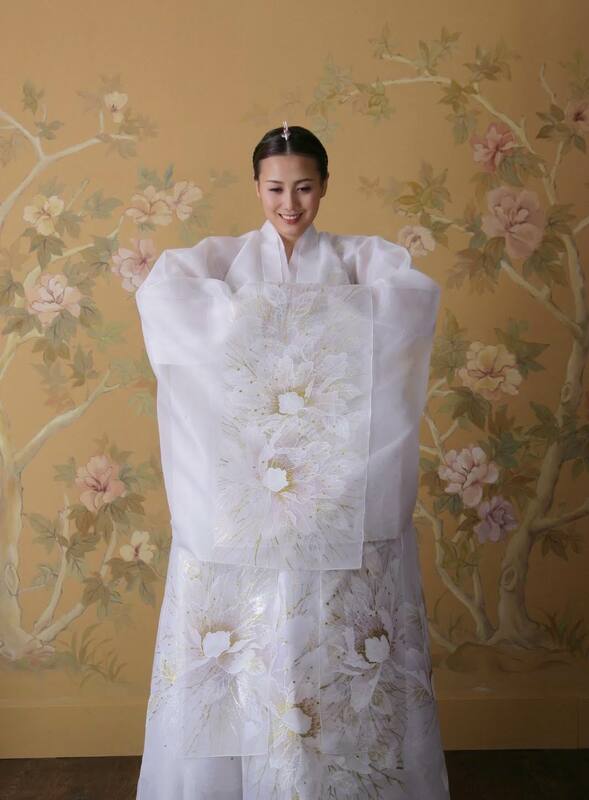 Likewise, when the Queen began to wear a double layered dangui the day before Chuseok which celebrates on every 15th day of August in the lunar calendar, all women in the palace changed their clothing to the double layered dangui the next day. 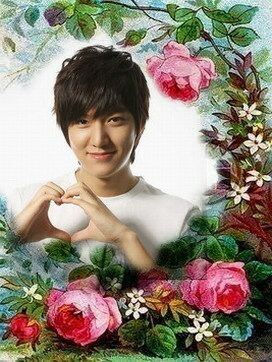 The characteristics of dangui is to emphasize the beauty of hanbok’s curvy lines. The form of dangui is similar to that of jeogori, the length of both the front and back which reach to the knees is triple to that of jeogori. Sleeves of dangui are narrow. The side seams are open to the armpit, and the hem is curved. When making a dangui with a yellowish green fabric, the color for the inner fabric and for goreum (고름, ribbons at chest) is red and purple respectively. Two goreum are attached at the left side of git (깃), a fabric band of that trims the collar while one short goreum is at the git’s right side. At the end of the sleeves of dangui is geodeulji, a kind of white patch attached.